Reprinted from The New York Times by Steven Greenhouse on April 8, 2017. “Like Ronald Reagan, Donald Trump racked up the support of millions of blue-collar white voters in Midwestern swing states, and like Reagan, the 45th president is pushing to nail down more blue-collar support to ensure a lasting Republican majority,” writes Steven Greenfield in The New York Times. “In doing so, Trump has championed many issues straight out of organized labor’s wish list — he is pressing manufacturers not to ship jobs overseas, he has promised $1 trillion in infrastructure spending, he has threatened a 35 percent tariff to slow Mexican imports and he has vowed to overhaul Nafta. 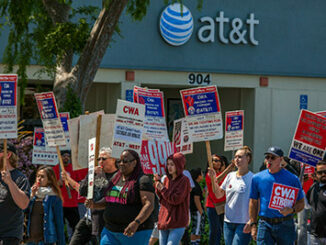 “While Reagan lined up support from only a few unions, Trump is seeking to go him one better; he is wooing many unions and their members directly, from carpenters to coal miners to autoworkers. 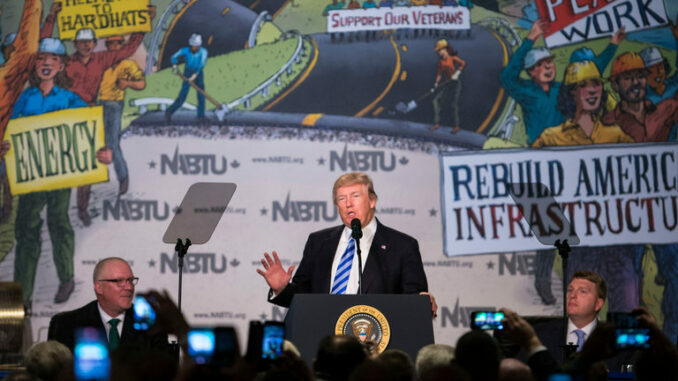 At a recent discussion on how to expand auto industry jobs, Trump invited the president of the United Auto Workers to sit close to him on the dais.